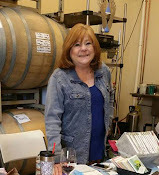 My last workshop was so much fun! 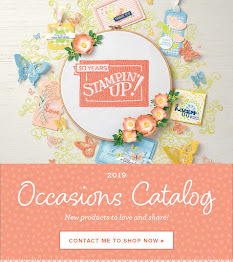 We made 3 cards using new items from the Stampin’ Up’s Spring/Summer Occasions Catalog and the Sale-A-Bration. My first project was my Valentine card. We used the Lift Me Up stamp set. I wanted to use colors that were fun. My fun colors this year are Melon Mambo and Black, cute for guys as well as girls. I got the idea for the floating hearts from another card with some designer paper with hearts that I didn't happen to have. We used the "stamp-off" technique. 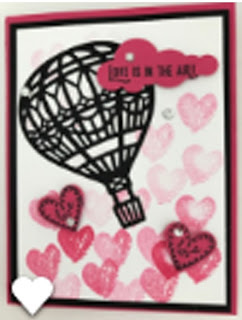 The darkest hearts are the Melon Mambo ink full strength then continued to stamp-off with out re-inking up the stamp. The balloon was cut out with the full detailed balloon Thinlit. There were so many tiny little holes it would have taken an hour just to poke out all the holes. We used the Big Shot Die Brush to help take care of this problem.